A professional instructor is there to help. No previous experience is necessary! Once to be a pilot himself and control the helicopter. A dream that not only shapes the childhood. The trial flight "helicopter fly itself" makes dreams come true and promises an unforgettable experience. The flight hour is similar to a helicopter training. You take personally seat on the pilot place and become on the double tax familiar with the helicopter. 1. Approx. 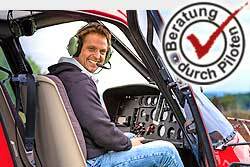 1 hour theoretical instruction in the control of the helicopter and the behavior of the aircraft. Providing basic knowledge in the areas of navigation, flight training, aerodynamics, weather, and hands-on training in the handling and control of the helicopter. 6. Approx. one hour theory incl. Meeting the second flight and passing a flight repeat. At this Airport is locally a landing duty of CHF 5.00 / per person to pay.